Are Your Local First Responders Ready for an EMP? On April 21, 2016, the House Transportation and Infrastructure Committee discussed an issue that many states and local governments aren’t addressing: The possibility of a widespread grid power outages that would cause people to be out of electricity for long amounts of time. According to an article in SC Magazine, the chairman of the committee, Rep. Lou Barletta (R-Penn. ), told members that they need to start helping states and local governments prepare for such an event. During the same meeting, Craig Fugate, the administrator of the Federal Emergency Management Agency (FEMA), said his agency was working with the Department of Energy to develop federal plans to respond to long-term power outages. Part of this operational plan, he said, would address national safety threats caused by long-lasting electrical power outages. While congressional committee meetings on this subject demonstrate that federal authorities are starting to think about such a disaster, not enough discussion is happening at the state and local level. Are Agencies Talking about ‘Grid Down’ Scenarios? There have been numerous books and articles written about the aftermath of a grid outage and the chaos that would ensue in every community. One of the best known is One Second After, a book that has propelled thousands of everyday Americans to prep. Even Ben Carson, during his bid for the presidential nomination, talked about how unprepared our nation is if the electric grid was brought down for an extended period of time. He noted that, as a nation, we should be doing more to safeguard our electric grid. However, none of the current articles, books, or any of the Congressional reports dealing with the aftermath of such an event mentions the role of local police or fire departments. It is assumed, and taken for granted, that police and fire would be able to respond to emergencies. Agencies must keep in mind that during such a disaster, gas pumps would not work leaving many firefighters and police officers stranded and unable to report for duty. In southern California, for example, most police and firefighters live more than 50 miles away from their duty stations, and many of the deputies I worked with lived more than 70 miles away from the station. So why aren’t police and fire departments doing more to train for this event? Why aren’t they having discussions about the implications of a grid down scenario and how their response would have to be modified? While many public safety professionals are aware of such a scenario and the dire consequences it would have on a community, why are these conversations not happening? If such a disaster did happen, police and fire departments would remain the primary responders. Federal agencies like FEMA would likely be just as paralyzed as the general population and local first responder agencies. No phones, vehicles, or aircraft would be working during widespread power outages, especially if it’s nationwide. Even in the best circumstances, FEMA wouldn’t be able to move resources or respond to every community all at once. FEMA simply does not have the resources to assist small or large cities on a national scale. Therefore, every community, neighborhood, and home would be largely on its own and forced to be self sufficient until order is restored. Police and fire departments are doing their community a disservice by not including this scenario in their disaster planning process. It’s not just an EMP that could take the power grid down but also sabotage, cybersecurity, or a solar event known as a Coronal Mass Ejection. I have a suggestion that I hope police and fire agencies will resurrect and reconsider. More than 30 years ago when I was a deputy, my sergeant told us in a briefing that in an emergency or disaster we should report to the nearest sheriff or police station. However, in a grid down situation, that may not happen because police and firefighters may not leave their families alone. Police and fire departments should consider taking a page out of oil refinery maintenance workers’ playbook about reporting for duty during a disaster. In an emergency, maintenance personnel have to work around the clock to get the oil refinery back in production and repair all the damage to the refinery, which could take a week or more. During that time, the maintenance workers must stay at the refinery and cannot go home to be with their families. To avoid maintenance workers being worried about their relatives’ safety, family members go to a preassigned location where food, water, communications and other resources needed to weather the disaster are in place for the group. The oil company takes care of the maintenance workers’ families because they value the job the maintenance workers do in getting the refinery up and running again. This is true of other critical industries, such as banking. Large banks have plans in place for this type of scenario, including off-site structures that allow the families of critical employees to purchase low-cost groceries and fuel. First responders should stop and think if their fire or police department has made such plans for their families. In order to keep personnel on the job if the grid goes down, station commanders must consider ways to keep officers’ families safe and taken care of, too. It’s time for police and fire to have a plan, or at least start talking, about what to do to maintain a semblance of order during widespread national power outages. Is Your Agency Prepared For for the Aftermath of an EMP or “Grid Collapse”? About the Author: Dennis Porter has more than 38 years of law enforcement experience with the Los Angeles County Sheriff’s Department. He is also a Community Emergency Response Team (CERT) member and trainer. Dennis holds a master’s degree in Homeland Security with an emphasis in Emergency Disaster Management from American Military University. Additional information provided by Noah, Preparedness Advice editor. This entry was posted in EMP, Fire prevention and tagged EMP, power grid. Bookmark the permalink. 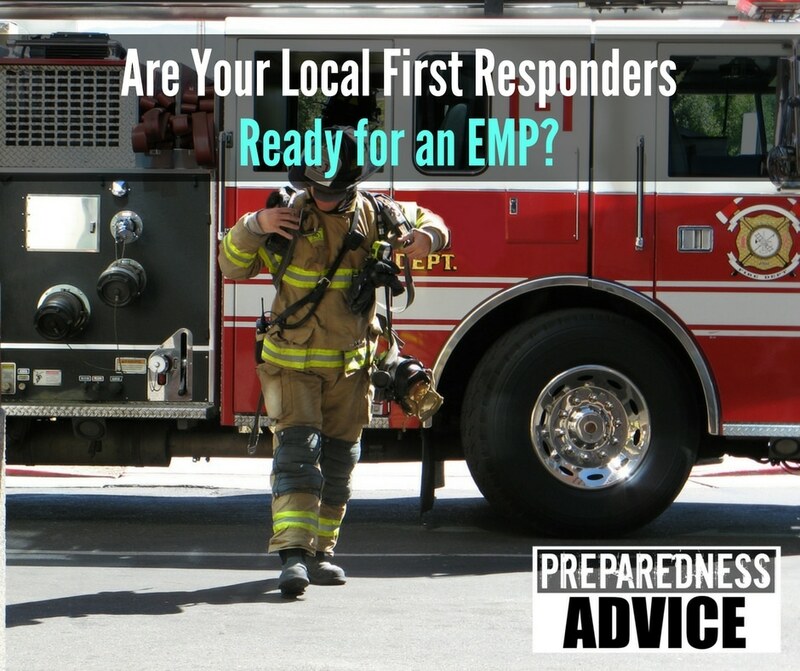 3 Responses to Are Your Local First Responders Ready for an EMP? Great article! I too have been in LE for over 25 years in California and Idaho. At ” no” time during my career has the decision makers entertained the notion of an EMP threat. I suspect an incident like this would be catastrophic for LE and the communities they serve due to modernization and connectivity. It’s incumbent upon individuals (including LE ) and their families to personally prepare for any number of events. People should not depend upon local LE to take care of them because they will be inundated with the Golden Hordes. I see you graduated from AMU. I did as well! Loved it. My Fire truck uses 13 gallons of diesel per 24 hour shift on a slow day. Same as most of the rigs in our department. Grid goes down we are dead in the water within 36 hours. We suppose to walk to response calls? Forget about it. As a patrol sergeant for a mid-sized police department in Los Angeles County, I used to present problem solving exercises to my patrol officers from time to time. It was a valuable part of training in my view. I recall one instance in particular. I put forth a scenario to my patrol officers where the entire L.A. County booking system, and our department’s report number issuance system, were unavailable. In the scenario we were told that both systems were not going to be down for a long time. Every officer, to a person, suggested myriad ways to try to repair the electronic systems. No one considered the idea of merely creating hand written logs to record sequential numbers for both reports and bookings until such time as the regular electronic systems could be restored. I was really taken aback by the experience. Fewer and fewer of our society, including first responders, are used to attempting problem solving away from electronics.